Master of Arts in Economics, Northeastern University, U.S.A. Bachelor of Arts in Economics, Tufts University, U.S.A.
2018 - Present : Independent Director, Audit Committee and Chairman of the Nomination and Remuneration Committee, Major Cineplex Group Plc. 2015 - 2017 : Independent Director, Audit Committee and the Nomination and Remuneration Committee, Major Cineplex Group Plc. 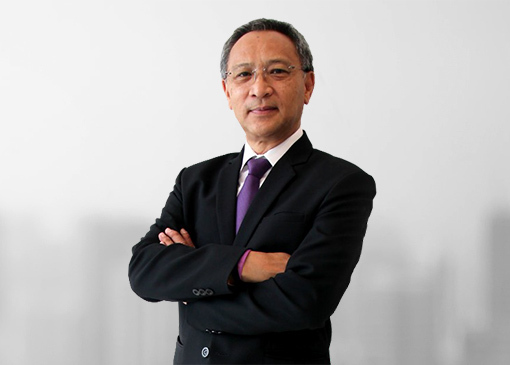 2017 - Present : Independent Director, Asean Potash Chaiyaphum Plc. 2013 - Present : Chairman of the Board of Directors, Pace Development Corporation Plc. 2009 - Present : Independent Director and Audit Committee, Samitivej Plc. 2008 - Present : Independent Director and Audit Committee, Vanachai Group Plc. 2009 - Present : Chairman of the Board of Directors, KT ZMICO Securities Co., Ltd.